With this episode we’re moving to another floor and getting a good amount of answers. Hakuno himself was in the spotlight along with the Dead Faces. We even got a bit more information about Saber’s previous master and her experiences in the grail war. It doesn’t seem as if the answer train is going to pause here either. Hakuno met up with the girl we saw in the first episode and it appears she is preparing to show him a video of sorts. 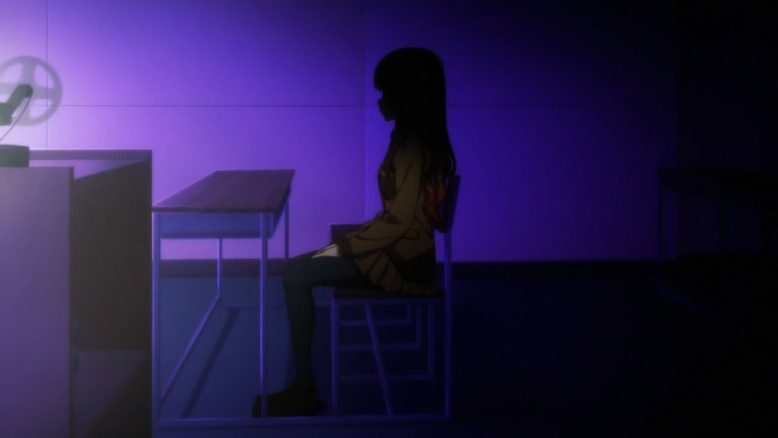 That is bound to lead to more answers the girl herself or clarifying Hakuno’s identity. Either way we are going to figure out a few more things here. And right now Hakuno needs some sort of revelation since he’s hit a pretty low point. I can hardly blame the guy though. It can’t be easy to basically be told you are a non-existence. If what he’s been told is accurate he is effectively a bundle of grudges and rage. The system that would effectively recycle deceased souls was shut down by this Twice person. 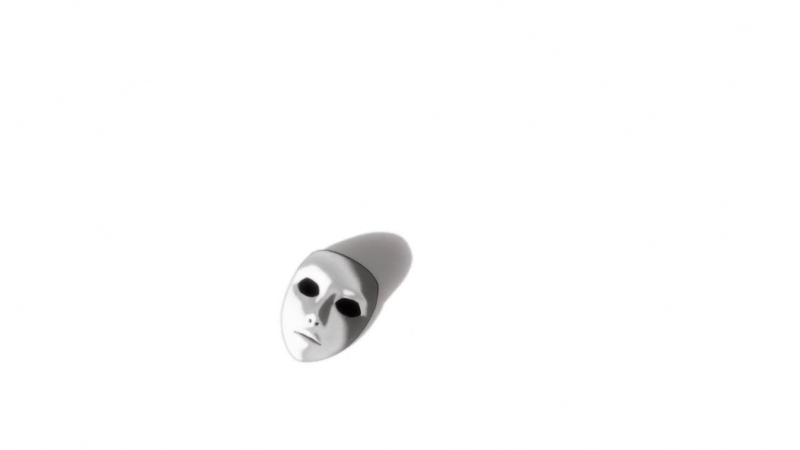 He made a situation where those souls just continued to linger and drop to the bottom. If this is true then that makes Hakuno’s existence quite the sad one. It isn’t just the idea that he’s lacking memories, but that he isn’t really a person. Hakuno basically only had this hatred driving him forward. Then he finds out that all that rage is his entire identity. It would make sense that Hakuno wouldn’t stand a chance against a Dead Face who has actual combat abilities. Julius is a beast and Hakuno doesn’t stand a chance against him. He honestly needed a rescue by Saber who honestly wasn’t in much a state for helping anyone. There are some interesting things to this though. Julius is one master who absolutely recalls Hakuno with clarity. We already knew though that Hakuno (or someone who identified themselves as him) had been through all this before. Still it was interesting seeing someone up against Hakuno who carried such resentment towards him. If it wasn’t for Rin being there and some extra assistance…things wouldn’t have ended even this well. Speaking of which, his servant is a real pain to deal with as well. His noble phantasm basically killing the opponent if he gets a single hit in is pretty devastating. Sure if you know how it works and are in a position to dodge you are fine…but Saber wasn’t. I’m not sure that Hakuno being careless was at fault, but in the end the results were bad. Saber took a bad hit there and we’ll have to see if she can get back up again. Hakuno himself is just about down and out as well. Hopefully this weird (possibly in his mind) meeting with that girl will help get him up again. 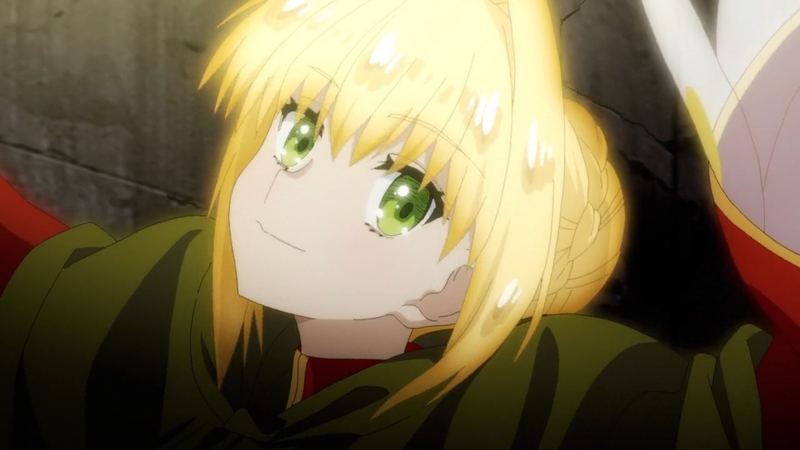 On the positive side…Saber is still adorable. I loved the little fun moments such as before they headed out onto the current floor. Just hanging out in the elevator and ‘preparing’ for the next floor. I did enjoy the time spent just having Saber chat away with Hakuno. She really can just go off and talk for days. It was nice for a bit hearing her talk about the female master she had before and making some decent points to Hakuno. Whether those words will be helpful to him in the next episode we’ll have to wait and see. I definitely want to see her stand back up as soon as possible. I suppose it is just good that ‘someone’ helped them out. While I’ve got some guesses as to who did, for now I’ll just wait and see. This show has been pretty effective at surprising me so maybe no point in trying to predict every single thing. Right now things just aren’t looking good. Saber is a mess, Hakuno is a mess, and Rin is pretty worn out from fighting that Berserker. This was an episode that got us a fair number of answers. Of course we don’t know everything yet, but the show isn’t over yet either. It was worthwhile to find out just what a Dead Face is. And I can’t complain about seeing Rin go into Lancer mode and try to kick some rear. 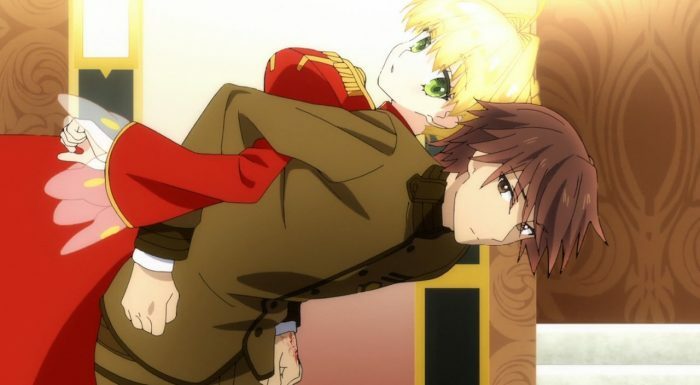 Admittedly it was also fun watching Saber drop that fight onto Rin, but it made sense by the end. She was running out of time before her body gave out and needed to save her master. Not exactly a fun situation for Rin, but such is. 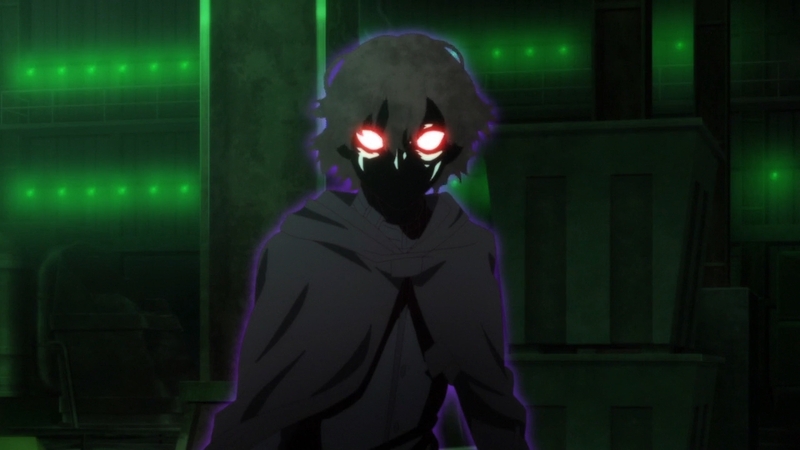 I just hope Hakuno figures things out and finds his motivation outside of anger.